Four new evangelists are celebrating after being admitted and commissioned from Church Army’s Mission-Based Training Course. Gordon Lamb, Karen Webb, Dawn Hudson and Nicholas Lebey have successfully completed the four-year course, which is made up of academic study and practical placements. This has led to them being awarded a Foundation Degree in Evangelism by York St John University, which is approved by the Church of England Ministry Division. More than 170 people gathered at the Wilson Carlile Centre in Sheffield for the occasion, including a service led by the Bishop of Chelmsford and Church Army’s Chair, Stephen Cottrell and Church Army Chief Executive, Mark Russell. When asked about her Mission-Based Training highlights, Dawn, who’s been based at the Warwick Gates Centre of Mission, said: “One of my most memorable moments has to be leading someone to faith in a mobile phone shop! Also, as part of the Pentecost Celebration in the town centre of Leamington Spa, I was handed a microphone and asked to preach and share my testimony in the open air. Nicholas Lebey, who has been working with non-churched young people as part of the Sorted Project at the Bradford Centre of Mission, said: “It has been a privilege seeing so many young people coming to faith, being baptised and then going on to serve in the Sorted church as young leaders. The four new evangelists will now begin their first posts. 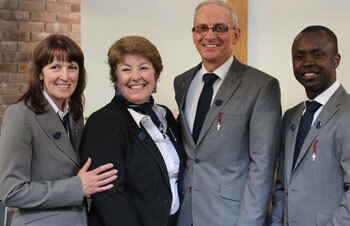 Gordon will be based at Trinity Churches in Shrewsbury, Shropshire, Karen will continue to work at the Lisburn Centre of Mission in Northern Ireland, Dawn will work as a Pioneer Evangelist in Sheffield with a focus on people experiencing mental illness and Nicholas will join the team at the Greenwich Centre of Mission in London.